Double game points, upsets, big plays, and nice weather all made Centex a hit. AUSTIN,TX—The action at Centex wasn’t quite able to match what occurred up at Northwest Challenge, but the Austin tournament was hardly an also-ran on the weekend. There were exciting plays, big comebacks, double game points galore, and a fair share of upsets. All of that with some very nice weather. It was overcast and not too hot or windy, and the excitement on Sunday more than made up for any chalkiness that occurred on Saturday. Here’s how it all played out. #8 Texas Melee took their third straight Centex title, posting an undefeated record in the process. They did have to survive a couple of scares to get there though. They narrowly edged Tufts by a point to knock them off in semis, and gave away a 6-1 lead against Ohio State before a late rally in the final to win. They were streaky all weekend. They went on big runs like the one that gave them the early lead in the final, or the one that put away Florida late in their pool play game. But they also had cold stretches, where they’d let teams hang around or claw their way back into games. Part of the up and down nature could be credited to the team’s relative inexperience. They had strong performances from several of their younger players like Caroline O’Connell and Amberly Malone. But their performances weren’t always consistent throughout a game. However, they stepped up in the biggest moments to make sure the games were won. O’Connell was especially impressive in the final, recording five assists. Texas rode that team effort but had moments of brilliance, too. Sutherland made some huge plays in critical moments. Laura Gerencser and Ivy Harrison both made highlight reel grabs throughout the weekend. And when it was all over, it was enough for Texas to win complete the Centex three-peat. #9 Ohio State Fever may have benefited from an easier semis matchup than they would have expected. Florida was a surprise opponent after their upset of no. 1 seed #11 Colorado in quarterfinals, and the Southeast team was completely gassed after that gritty and emotional win a round earlier. But Fever proved their worth in the final, nearly knocking off Texas with a huge come from behind effort. Ohio State did have a few other tumultuous starts, coming out slow in all of their pool play games. But they grew into each game and grew with the weekend. Sadie Jezierski tended to play a part in their second half resurgences, but she wasn’t dragging Ohio State to wins. In fact, her offensive playtime was notably limited. Ohio State got key offensive production from Annelise Peters in the backfield and Emily Barrett downfield. Cara Sieber also had an impressive weekend and made plays at every level of the field. Veteran Corinn Pruitt also had a strong tournament, but it was mostly those young players who showed out this weekend around Jezierski. This Ohio State team has a solid, young support staff and they’ve improved nicely over the course of the season. They still need to eradicate those slow starts and clean up some of the execution errors, but in their brightest moments at Centex, Ohio State looked deserving of their top 10 ranking. #12 Tufts Ewo may have actually been the most impressive top seed in pool play. They appeared to have the most competitive pool, but they blew out everyone they played, easily posting the best score margin of any of their fellow one seeds on Saturday. And they’ll certainly be happy with their 5-1 record, with their only loss coming by one to eventual winners Texas. On Sunday, however, when they ran into teams with more depth than their Saturday pool opponents they weren’t able to keep that dominance rolling. They slogged and slugged their way to an 11-10 double game point victory over Washington University in their quarterfinal matchup. They played to within one of Texas again, this time losing 13-12. In both games, their offensive efficiency was mostly fine. They were only broken twice against Texas. But they didn’t generate enough quality break chances against Texas, and weren’t very efficient with the ones they did get against Wash U.
Tufts likes to spread the load, relying on their systems more than any set of players. But at times it felt like they needed an individual to step up and make a few special plays for them, particularly in the Texas game. Tufts is a team in transition right now, having relied on a couple stars to do a lot of the work for them last season. That will cap this young team’s ceiling a bit this year, but could help them over the next season or two. One player who did show glimpses of true big play making ability was sophomore Margo Urheim. It didn’t happen often thanks to the impressively solid play of the team’s handler core — primarily Megan Wilson and Hannah Wells — but when Tufts needed a big catch on offense, a lot of the time it was Urheim stepping up to do that. She was quick and timely with her cuts, and used her height and athleticism well to make some tough grabs in big moments. Tufts will continue to win the majority of their games thanks to their depth and solid style of play, but it’s nice for them to know they have some flashiness in their locker for when they do need it. Florida FUEL needed a strong weekend to get their season on track after three disappointing tournaments to start 2018. But their Centex performance was stronger than most could have imagined. They started by putting a real scare into Texas before giving up a run right at the very end to lose 13-10. They then upset no. 7 seed Northeastern and held onto their spot in the pool standings by holding off Utah. Their performance in pool play was solid, especially the game against Texas. But where Florida truly made their weekend special was in bracket play. In what looked to be the most intriguing prequarters matchup on paper, Florida dismantled Wisconsin. Then in quarters they shocked Colorado, breaking them on double game point to win 13-12. Against Colorado, Florida played tough, gritty defense that bordered on chippy at times. Their zone gave Colorado a lot of problems, and great individual performances from Gabby Krajniak in the defensive middle, and Lauren Bahng and Courtney Testa in the offensive backfield were enough to earn the win. The win was marred a bit by a bad injury to Lucy Berman late in the game, and some calls that probably would have been overturned had the game been observed. But overall it was a thoroughly impressive performance from Florida, one we haven’t seen from them in a long time. With their weekend performance Florida made it clear that they’re coming in strong to defend their Southeast regional crown. If they play like they did against Colorado and Wisconsin, they’ll be tough to dethrone. For Colorado Kali, the Florida loss was a mere blip on an otherwise strong weekend. They were without Nhi Nguyen, who is still hampered by a nagging hamstring injury. And they were also missing Katie McCormick, so we still haven’t gotten a chance to see a full strength Kali over the last couple months. But in spite of the Florida loss, they still had mostly good things to take away from the weekend. They won their pool without too much trouble, and put on impressive offensive displays, stringing together turnover free points with ease. Kelsey Bennett helmed an offensive unit that was in sync for much of the weekend. But what held Colorado back from making the final–or making semis–was their D-line’s inefficiency. Even in their blowout wins in pool play, their D-line struggled through some really long points where they just couldn’t get their offense going. Still though, Chastain was mostly pleased with the weekend, particularly with how they finished: two comfortable wins in consolation play. Kali didn’t go as far into the tournament as they would have hoped, but the loss to Florida was the only game they won’t look back on fondly. They easily could have won it and then it might not have been a talking point at all. Coming into the tournament, Colorado needed a bounce back weekend after a disappointing Stanford Invite. They still have some things to work on, but in terms of performance, they got that for the most part at Centex. Washington University very nearly upset Tufts in quarters, losing on double game point. They didn’t quite have the offensive efficiency necessary to get the win — at one point they played a 25 minute O point! — but they were a scrappy group that gave the top teams trouble all weekend. Speaking of double game point…the bracket saw four other one point games.1 Northeastern beat #19 Colorado State 13-12 in prequarters, Northwestern beat #23 UCLA 11-10 in prequarters, Florida defeated Colorado 13-12 in quarters, and Texas beat Tufts 13-12 in semis. And speaking of Wash U…their nice weekend wasn’t just on the ultimate field. They also deservedly took home the dance off crown. Their matching wardrobes, synchronization, choreography, and song choice were all top notch and they were the deserved champs. Brava. A pair of noteworthy upsets from the Tier 3 over Tier 1/2 teams in consolation play: no. 21 Texas State beat no. 12 Iowa State in consolation quarters, while no. 18 Boston beat no. 14 Virginia in the consolation final for 13th place. 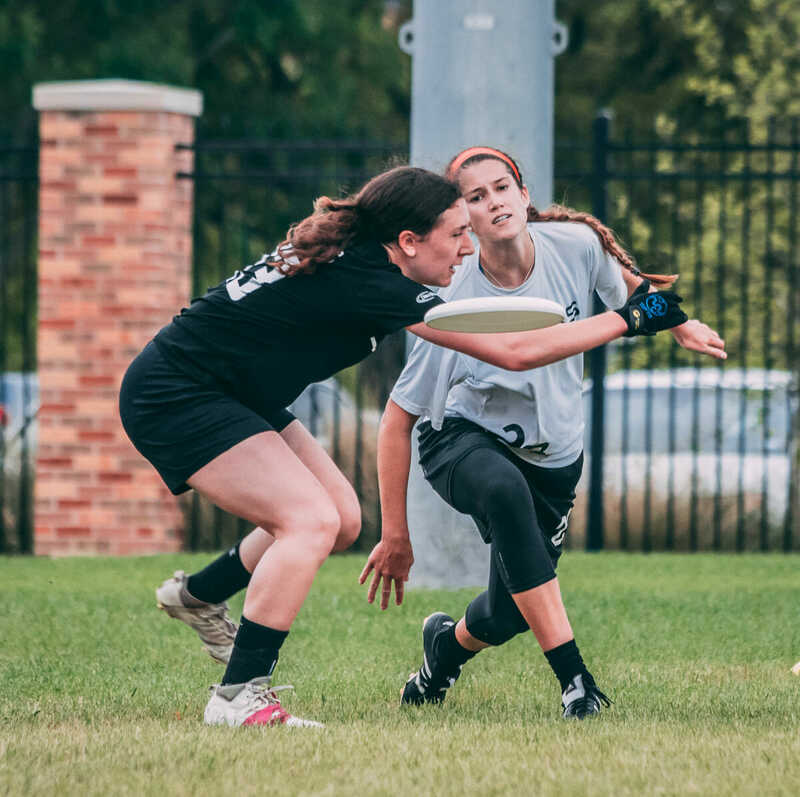 Comments on "Centex 2018: Tournament Recap (Women’s)"